Operation Care Package is a non-profit organization that receives, fills and mails drawstring bags to deployed service men and women from all branches of the armed forces. 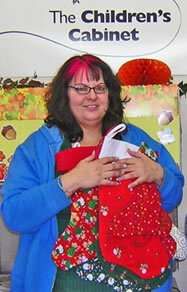 The drawstring bag pattern for this project was designed by Laura Martell of The Creative Thimble. The 14” drawstring bag holds a filled gallon baggie. The troops use the bags for personal use and some pass them on to the children. 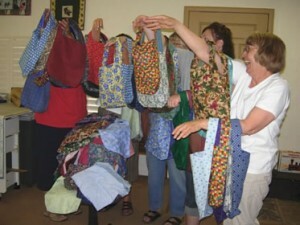 Northern Nevada Chapter made 185 ditty bags to contribute to this project. For those wishing to continue making these bags for our chapter, HERE are the instructions. The 2009 National Community Service Project had approximately 5,000 pillowcases that were donated to the Albuquerque Ronald McDonald House! This number does not include the pillowcases that were distributed to local charities by each chapter. Pillowcases dimensions were measured at 21” x 32” and were made of 100% cotton in children’s prints and bright colors. 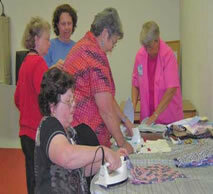 Northern Nevada Chapter contributed 216 pillow cases to the project. The Anti-Ouch Pouch is a pillow that hangs from the shoulder, fitting snugly under the arm to cushion the area after breast surgery or during radiation treatment. The wedge shape gently holds the arm away from the body when the user is standing. The strap holds the pillow in place without having to use sore arm muscles to “clutch” it. The strap is adjustable and the fiberfill may be adjusted via the overlapped opening. 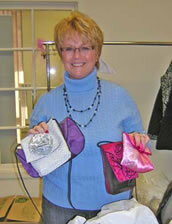 Northern Nevada Chapter contributed Anti-Ouch Pouches to the project. The special iCare downloadable patterns include sizes for men, woman and children, making it suitable for a variety of health-care related charitable sewing projects. The downloadable program is free to anyone who wishes to sew garments for non-profit and charitable purposes. 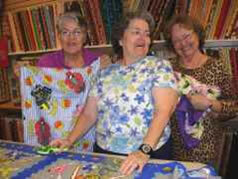 Northern Nevada Chapter contributed gowns to the project.